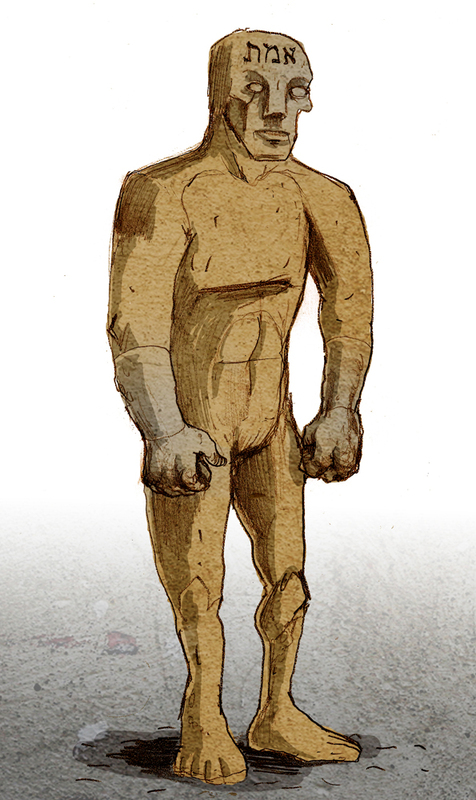 The Golem, the Homunculus – most have never heard of these terms. These terms and the concepts they stood for flourished in the middle ages in the Middle East and through the Middle East into Europe. The men behind these ideas, seeking immortality and superior human abilities and powers, were the ideological predecessors of the transhumanist movement. This herbal and alchemical approach to reach immortality and rejuvenation, extended itself to attempts to create an artificial consciousness. From the emic perspective of the alchemist, the act of takwin was an emulation of the divine creative and life-giving powers of Genesis and Resurrection and tapped the physical and spiritual forces in nature. At the same time it was an act through which the alchemist was inwardly transformed and purified, a spiritual regeneration. Thus, all kinds of life could be produced using alchemical methods such as the creation of minerals (takwin al-ahjar), of plants (takwin al-nabat), of animals (takwin al-hayawan) as well as of men and prophets (takwin ashab al nawamis). This was produced by artisanal action (sani). The school of Jabir continued to publish books, as did other Islamic alchemists, some of whom published in their own names and some of whom published pseudonymously. While these subsequent works drew upon Jabir, they added significantly to his legacy. Among the more interesting pseudonymous works is The Book Of The Cow, which was attributed to Plato but is clearly of medieval Islamic provenance. In addition to recipes for creating bees out of putrefying cow and vice versa, The Book Of The Cow also offers a recipe for a homunculus. A homunculus is an artificial humanoid manufactured through alchemical recipes, generally as a means for acquiring magical powers of the answers to difficult questions. The homunculus of The Book Of The Cow has superhuman powers; it is thus a significant departure from Jabir’s homunculus which seems more or less identical with an actual human being. William Newman in his book entitled, Promethean Ambitions: Alchemy And The Quest To Perfect Nature states that homunculus “…of the pseudo-Plato and Jabir traditions could not only talk – it could reveal the secrets of nature.” There were specific instructions on how to make a homunculus based in part on the Aristotelian theory held in that day regarding the existence of spontaneous generation. This theory provided a conceptual basis for the ability to bring forth life forms from non-living things. קַבָּלָה, meaning “receiving,” (founded on a manner of interpretation based on mystical Rabinnic Judaism), was first mentioned in the Talmud when speaking about Rava (רבא). Rava was a Jewish Talmudist who stated that artificial life could be created by a life of absolute purity. Raba said: If the righteous desired it, they could [by living a life of absolute purity] be creators, for it is written, But your iniquities have distinguished between etc. Rabbah created a man, and sent him to R. Zera. R. Zera spoke to him, but received no answer. Thereupon he said unto him: ‘Thou art a creature of the magicians. Return to thy dust. Even further Ronald Eisenberg in his book titled The JPS Guide To Jewish Traditions explains the basic concept of the Golem. According to Sefer Yetzirah and other mystical books, it is possible (using a detailed set of instructions) to create living beings out of earth using secret combinations of the letters of the Hebrew alphabet, the names of the 10 Sefirot, and the secret names of God. Legends maintain that a golem is incapable of speech and lacks a soul but has superb vision and superhuman strength and generally follow its mater’s orders without question. To the Jews the magic was in the name of God being brought forth and focused for power. There were many names of God according to kabbalists. Of course there were also materials that were shaped, such as virgin soil that was from a place where no man had ever dug and water that had never been poured in any kind of vessel. These stories have had an important effect on the development of the robot. In 1921 Karel Capek a Czech playwright wrote a play entitled R.U.R. based on the ancient Jewish Golem story. This play utilized the word robot for the first time. We include a French Documentary with English subtitles which is the most complete explanation of the alchemy practiced during the middle ages. The only difference to the ignorance of many is that it is still practiced today by modern alchemists. If you cannot see the embedded video here is the link: http://bit.ly/jshYU3. As we move into the Middle Ages in Europe and into the Enlightenment of the 1700s, these ideas would not die. It’s hard to argue that the human trajectory of technological development has not benefitted the human race. The criticism I hear is based on our current state of consciousness, based on our current state of physical being. Transhumanism is about transcending former capabilities, which means that we aren’t benefitting from a truly transhumanist consciousness; we are mere mortals postulating mortally about the transhuman future consciousness. Given what we know about humans and technological development, I am confident that the overwhelming human impulse for doing good and starring down the evil will prevail into the future in ways that are probably going to be grandiose. Yes, the Corporatocracy will have to be challenged, but we the people are more than ever up to that challenge. A lot of us know the code. The criticism of Ezra brings an interesting warning: we must also think about the moral evolution, not just technology. But the criticism of Ezra seems unaware that this issue is not neglected by transhumanists (but in fact, there is perhaps an excess coverage of the technological aspect, the gadgets). One of the most prominent transhumanist thinkers, David Pearce, has always emphasized this point. The philosopher Max More as well. As transhumanist, I’m not hungry for power. My aspiration is merely… exist, always evolving, trying to reduce suffering in the world and explore the cosmos with my mamal instinct of curiosity. Ezra speaks of esotericism, meaning of life and etics. Regarding to how we should guide our lives in relation to others, I believe that religious or esoteric thought can contain some valid meditations and observations. They are reflections of thousands of years, there have always been great religious thinkers, of course it is possible to selectively find good material for reflection in religion. Always selectively. On the other hand, I would do the following critique of esotericism and religion. These spiritual resources, for millennia, tried to give support and meaning for life in face of death based, as far as we are given to know, on lies (the existence of an eternal spirit or a reality after death), and in affirming things we do not know. This is the cruel and ironic part of all religion and esotericism: it promises you eternal life, but the only thing It can offer you is death, wrapped in fantasies. The true believer is like a child who asks his father a fish and receives from him a poisonous snake. The believer (esoteric or religious) wants life, and comfort in the face of death and depletion of meaning that death brings, but the only thing religion or esoterism can give is a placebo to this desire. I think this is cruel (though perhaps the best people in the past had to make social life possible). You sound very zealous about transhumanism, and I do hope you get all you want through its achievements. I personally think that it is very easy to attack or criticize spiritual teachings and claim that they are hoaxes, because -unlike science and elements of scientific progress-, the achievements it offers are essentially very personal. They are susceptible of proof. I can never prove what I experience through spiritual practices. Even if someone achieves something provable-ie observable by everyone-, the absolute state of devotion requires absolute isolation and disinterest in the world. Nobody ever opens up a blog, posts a video on youtube about his/her “spiritual skills and achievements”. It’s completely a different mindset and perception of the world. So, thinking that “The true believer is like a child who asks his father a fish and receives from him a poisonous snake.” is well, what I would call cruel. And your view is very mono-theistical and humane, in the way that God is taken to be a separate, individual being which is a form of a superhuman. (For instance Gnosticism very clearly draws a line between The Source and the creator of the world, Demiurge, which is also called “the fool creator”. And he is called “fool” because he is completely ignorant of what is higher, yet fully capable of doing simply everything in the physical existence.) Spiritual devotion or spirituality is not only about praying and wishing for things from God. It is heightening the quality of your mind and soul identical to “divine”, so that you’ll have divine qualities. Of course, as the commentator below says, what many people consider “divine” can be totally achievable through technology. However, there are already teachings that have a different view of “divine”; different from the most well-known teachings or religions. And in fact I do not think this is a proper website to talk about esotericism at all. I’ve posted those messages because the article was taking a very materialistic approach to some esoteric views, which I think is wrong in principle when you think that esotericism is actually a body of spiritual teachings. I like following this website- but one should never ever be naïve about humanity, and existence in general. Personally, I like the idea of us becoming nearly immortal through enhancements. Once wrote a short story on a race of God-like beings (this was a while ago, and now I’ve lost the file, can’t remember the name of it). The “Goddesses” as they were called, had a religion similar to human monotheistic religions, and that ideal stuck with them as they created technologies (their technologies were solely for travel, not for development, they were naturally given powers which strongly differed from other animals, which is symbolic of human nature’s difference from the nature of other animals) and explored space. Anyway, the Goddesses believed that they were the “daughters” of their deity, Dragoras, and at the apex of their empire, when peace was brought to their world, they had “matured”, just like any child. So from there, they decided to do what their God did: create life. I forget a lot of the details of what happened next, but I think it was like, one Goddess rebelled and ended up creating a machine or something that ultimately obliterated the Goddess homeworld. How this relates to the whole discussion above? We can become like the Goddesses, if we hold morals and spirituality close, but we’re still mortal, and the human element can abuse what we’ll create, and destroy us. I personally have no problems about immortality and technological advance. Esotericism and Buddhism are about gaining immortality too. However, the way they present is through “enlightenment”. This analogy would fit here i guess: Esoteric texts are highly symbolical. If you are not initiated into the symbols and processes as reflected in the teachings, you’d think they are the most stupid and meaningless texts written on earth. However, this is done on purpose, and the aim is that the knowledge will not be understood by unenlightened people. So, the more ridiculous and the more meaningless the text looks, the more masterly it’s written. The result is still today mythologies are considered to be “poor primitive man creating fanciful stories to natural phenomena they do not understand”. Whereas they are completely symbolical, and esoterically they have profound meaning. Yet if you do not about esotericism, you can never know what mythologies are about, you say “what a silly thing”. Presenting knowledge to everyone always brings along the danger of abuse. Maybe, you should plan in it such a way that you educate or well, program people to be “enlightened”, you emphasize enlightenment right from the beginning. But i like this one better: For example Jainism holds the view that “Karma” is actually a physical dynamic, which means it can be scientifically proven. If such a thing happened, Karma would be seen simply as a physical dynamic just like the phases of the moon, and everyone would know the results of it and behave accordingly. I expect many “spiritual” views of things to have scientific and physical explanations when we have more scientific knowledge. That’s what esotericism is all about. Very true. But agreeing with your earlier point, we need to improve the moral part of the human conscious if we are to advance technologically. If we do that, then we’ll become what the “Goddesses” in the story wished to be. Strange that think that we can already write history about something which (technically) hasn’t happened yet. Which brings up a question I’ve asked myself and others now and then. Transhumans would be immortal, or nearly so. Where would “history” begin for them and “memory” leave off? Very interesting, thank you for your research into this topic. I do not know of any specifics but from a cursory observation I would say that the topics of gnosticism, alchemy, and the Kabbalah are all interrelated and provided the “seeds” of modern scientific thought. I would also add that the seeds may have been planted in the human “collective” consciousness by even earlier influences, pre-flood influences. What i personally find essentially misdirected and abusive and well, harmful in ultra-rational technological movements is that they are ideologically pure Western, by which I mean they are based on the absolute opposition between spirituality and rationality. Whereas they are just complementary to each other. For instance, M-theory makes use of 10 (or 11) dimensions. As we know more, the number of dimensions may increase, some of these dimensions are probably non-physical and some of these “dimensions” may be attainable through technology. The thing is, in Buddhism, there are 10 levels of realization through enlightenment; according to Kabbalah, God’s entire creation is composed of 10 emanations of Light –“the perfect order of 10”; in Hinduism there are 10 levels of consciousness; Christian Gnostics believe in a cosmology of 10 heavens. 10 is the perfect number for the esoteric philosophers (symbolizes the ultimate development and completion after single-digit numbers), thus Pythagoras believes that the cosmos is divided into 10 heavens. (Esotericism claims that several ancient philosophers including Aristotle and Plato were in fact initiated into esotericism). One can reach the same knowledge through spiritual practices, as well as physics. They are not enemies at all, as many very rational people think. Well, two centuries ago you could go from Britain to USA only with a ship, and that lasted more than a week. Today, you can travel the same distance within hours. That does not make your life (or existence, rather) more meaningful. That does not make the world (or the universe) a better place. That does not make you happier. And that does not make you a more developed (take it as mentally or spiritually) being as a human. You might be travelling in the fastest plane and think of hijacking it, you might be in the fastest plane being completely depressed, you might be in the fastest plane after breaking into a house, killing someone, beating someone. Having Ipods did not make anybody more virtuous too, for instance. Turning back to the plane example I gave in the beginning: no technology will make anything better or more meaningful in the philosophical sense; unless you have the development inside (I don’t necessarily mean something “spiritual”, it may be a way of perception, way of feeling/thinking etc) of you. You think “dying when I choose” is a great thing; you still won’t have any idea about what will happen after you die. And what is the difference, leading a completely hedonistic or selfish life and advocating pure physical transhumanism? What is the meaning of such a perfect and un-philosophical and well, ignorant life or existence? For example, when i read some of the commentaries on this website, there are people so unkind and immature (take it as mentally or spiritually); you know, religious people trying to degrade liberate thoughts on sexbot for instance; or atheists calling the religious “ugh, those primates”. Well, very probably, with such a mindset and with such hostility inside, neither being immortal nor being capable of inter-stellar travel will make you feel good. As they say, cleverness (or power in this case) without wisdom is not a good thing. And the simple truth is that humanity, presently, is at an enormously low degree of development (take it as mentally or spiritually or technologically). When I go through some commentaries here, I tend to visualize such absurd things: An immortal atheist trying to find ways of brainwashing or converting some religious or even theist people; conservatives with bones that cannot be broken disgusted by a homosexual couple kissing, protesting homosexual marriage; teleporting politicians colonizing beings of lower technology, making experiments on them. If you think that when we will have so much technology or concrete/physical development, and such prejudices or narrow-mindedness, or hostility will be resolved by itself; well, you know nothing about humanity or history. And, for instance, if you think that humanity should have absolute power and comfort, then you must have a philosophy whether it is right or ethical or whatever to assert control or power over other things or beings. You should have a philosophy about what is good or bad; what is harmful or helpful for a being with the presumed lifestyle, existence, powers, etc. If you do not, then we have a huge problem here. Esoterically speaking, alchemy itself has two sides: One is the physical action of turning lead into gold; and the other (symbolical) is turning the quality of the spirit from lead into gold. These two constitute the actual knowledge of alchemy. If you’re completely into one and do not care about the other—in the very long run (be it a thousand or million years), very probably, you will realize that you were on the wrong track. I would agree, we’ve seen technology do bad things in the wrong hands, but good things in the right hands. Humans need to evolve mentally and spiritually at the same rate as their technology. While you make logically consistent arguments you seem to be missing a core conceit of Transhumanism. The simple fact is that the ability to traverse distances faster than a person from two centuries ago does make my life more meaningful and it does make me happier. It means I can do more and see places that I wouldn’t have been able had I lived two centuries ago. Every technology that means I have to do less tedious tasks or that means I can do more things fundamentally adds meaning to my existence because derives fro the results of my deeds and not my methods for achieving them. As for your statement about technology not making people more virtuous, well that is a non sequitur, and an incorrect one at that. Crime rates in technological societies are lower than those of non-technological societies precisely because the more comfortable we are the less likely we are to turn to crime as a method for getting what we want. As for technology not making life more meaningful in a philosophical sense you see to be missing the meaning of philosophy. Philosophy is not solely concerned with life after death and as I already said better technology can very easily be shown to make my life more meaningful. It may be possible to hijack a plane, but I don’t need technology to be a bad person, I can do harm just fine with my own body. However, the plane allows me to be anywhere in the world in 26 hours and allows us to provide areas in need with desperately need supplies. The internet lets me extend my mental presence to anywhere that is connected to the internet. I mean I just responded to a comment by a man or woman I’ve never met who could be thousands of my miles away. And you’re going to tell me technology doesn’t add meaning to my life. The meaning in my comes from my good deeds and my reputation among others, and technology helps me do good deeds and help others so technology very easily adds meaning to my life. One last thing, as for life after death I legitimately don’t know but I doubt that there is one. And I don’t intend to find out, I’m perfectly happy with trying to build a paradise here in this life. Sorry if any points were unclear, just ask and I’ll try to clarify. What you wrote is quite clear, except for I was not trying to say that philosophy is mainly related to spirituality or life after death. What I meant was transhumanism as a movement do not have any satisfying ethical standards, views or treatises about it. The original article makes use of some esoteric views and if you go through the history of the occult, stripping alchemy of its spiritual side and only working for creating gold is considered to be a misuse and misperception of nature and natural dynamics. Because it is pure materialism. It’s like saying “I think the ultimate value in life is earning as much money as you can”. Whereas one of the main tenets of esotericism is that physical existence is solely and only the reflection of something (a form, a dynamic, a phenomena, a place etc.) in the “higher realms”, which are basically non-physical. Esotericism argues that physical existence/realm is a very low form of existence and it should be surpassed as soon as possible. Its major aim is not to make developments in the physical existence, and not to create golems. I think that only seeking technological development is a strain of unbalanced progression and enlightenment and development are different things: You can be ultimately developed and ultimately unenlightened at the same time, which would create negative results in the long run. The thing is, for example, have you ever thought you create a robot which is capable of feeling as well as thinking and at some stage it feels not so right and it suffers. Do you ever think what would your responsibility in it would be? What would your responsibility be in anything, any archetypical development you create, in terms of its influences in the long run? I’m just saying transhumanism as a movement must have a philosophical treatise in relation to such things. (Human existence may well be something like that because human mind mystifies things it does not understand, and many people believe there is something called fate or destiny whereas what is called fate or destiny might simply turn out to be the programmed software of your experiences. Someone just like you or me might be responsible from our lives). You’ll find me quite speculative but I think “having/owning” super human capabilities will probably not turn out to be the ultimate state of existence. I’m almost sure that at the stage of ultimate development and physical knowledge, ie. creating galaxies, different beings, parallel universes; being immortal and perfectly healthy, copying minds and everything, you’ll be asking what is beyond all these; and it seems to me you won’t have an answer. Because, I believe, the answer surpasses what you view as the ultimate physical development or perfection. Talking about creating galaxies or other forms of beings; I think transhumanists should also philosophize about “What is the meaning or purpose of creating things or galaxies?” in the first place. Just thinking it would be interesting or fine or a good pastime, or you’d feel you’re in charge to watch something like the video of Björk’s “All is Full Of Love” is not a proper answer to me. You know, for instance, many people have children without knowing why: because everyone else has children, because they should keep their marriage, etc. Which are not reasonable reasons.